This is a beautiful Champagne/Ivory gown with Champagne tulle and Ivory lace. It is brand new and was just picked up from Alexandra's Bridal in Fall River, MA. It is a size 6 and has had no alterations. The Champagne color tulle skirt has a slight blush color and is absolutely stunning. This is a brand new style that was shown on the runway at the beginning of 2018. 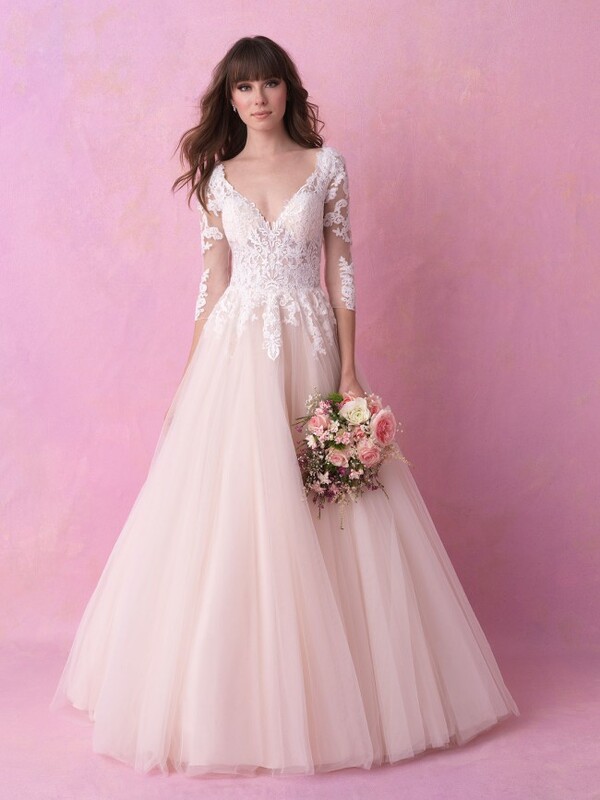 I am hoping that someone will be able to wear this absolutely beautiful gown on their special day because it is truly a unique show stopper. An extra piece of lace applique from the dress was specially ordered with the dress as an optional add-in to raise the neckline slightly if desired. This piece of applique will be included and it is shown inserted into the neckline in the close-up picture of the bodice.